What are antioxidant rich foods? One of the best things about antioxidants is how easy they are to find in antioxidant rich foods. Many people often wonder what are antioxidant rich foods; they also wonder what foods are the richest in antioxidants. Antioxidants can be found in a variety of foods, but some foods are higher than others are. Fruits, including some dried fruits are very high in antioxidants, berries containing the highest amount of antioxidants when it comes to fruits. Vegetables, such as artichokes, spinach, peppers, and red beets contain high amounts of antioxidants. Legumes, nuts, seeds, some cereals, and spices are also foods that contain high amounts of antioxidant. To ensure that you are getting an adequate amount of antioxidants you want to eat at least 5 servings of fruits and vegetables a day, the more you eat the better though. Different colored fruits and vegetables provide you with different types of antioxidants so you want to eat a wide variety of fruit and vegetables. One problem that people have when trying to intake an adequate amount of fruits and vegetables is that they claim to not like the fruits and vegetables that contain the highest amounts of Antioxidants. 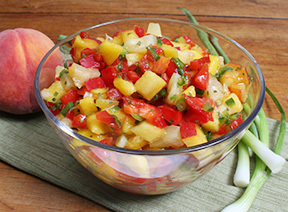 Here are some recipes that you can try when cooking certain fruits and vegetables. In a large bowl mix together kiwis, apples, raspberries, strawberries, white sugar, brown sugar and fruit preserves. Cover and chill in refrigerator for at least 15 minutes. To eat the fruit salsa you can use regular tortilla chips or you can buy some cinnamon chips from the store, you can also make your own cinnamon chips out of flour tortillas. Add ¼-cup water to the pan and add the spinach. Cover with a lid and let spinach steam for 4-5 minutes. Remove spinach from heat and place in shallow bowl. Chop the spinach into bite size chunks, add onion, and garlic mixture. Mix thoroughly and place spinach in casserole dish on top of the cheese. Top the spinach with the remaining cheese and place in oven for 10-12 minutes, cheese should be brown and bubbly.